Most lower priced bicycles come with pedals, but most higher end bikes don’t have pedals at all out of the box. Most customers buying a higher end bike will already have a favorite pedaling system and new riders are best advised by their bike shop, so the bike manufacturers don’t guess what you might like. It’s up to you. Anyone who has ever ridden a bike will be familiar with the basic platform pedal. Usually made from tough plastic and/or metal all you need to do is plant your sneakers on the pedals and cycle off. In the past, people have made these pedals more secure by attaching straps and cages which wrap around the shoe. Indeed, some still prefer this method of locating their feet on the pedal. These days anyone other than the most casual cyclist can make a choice from a number of clipless pedaling systems. That is where pedal and shoe locate and engage together to make a secure and efficient interface between your foot and the bike. 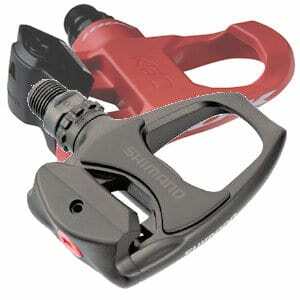 All clipless systems depend on a metal or plastic fixture known as a cleat, which is bolted onto the sole of the shoe. This cleat locates and engages into a mechanism on the pedal. The pedal holds the shoe firmly until the rider decides to disengage, usually by a deliberate twisting motion of the foot. 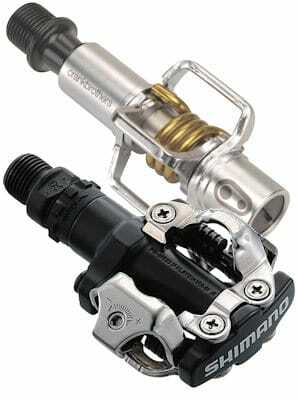 Although there are several manufacturers, each with their own system, clipless pedals fall into two categories. 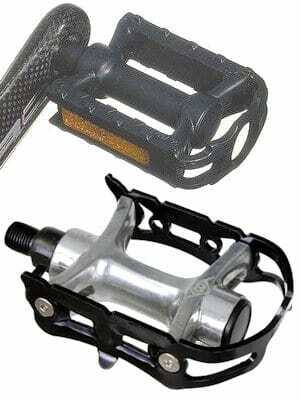 Mountain bike pedals : This type of pedal/shoe combination is marked by a small metal cleat which is retained within the sole of the shoe and a double-sided pedal. This means that the shoe is easy to walk in and it’s easier to locate the cleat onto the pedal. Even the most advanced mountain bike shoe with a carbon fiber sole is designed to flex to facilitate walking, so although this type of system was designed specifically for mountain bikes, many of its characteristics make it a favorite for many road and touring cyclists too, so the name is a bit of a misnomer. We frequently sell “spinning” shoes to customers attending local gyms. A spinning shoe is a mountain bike cycling shoe. 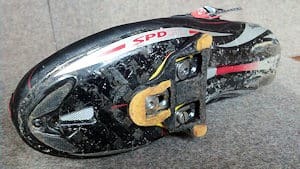 So if you spin and become familiar with engaging and disengaging from the spin-bike pedals, consider having clipless pedals fitted to your regular bike. 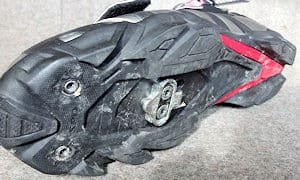 A basic mountain bike shoe with velcro type fasteners, suitable for spinning too, will cost from around $100, and a high end shoe with light-weight carbon fiber sole and ratchet type fixings will be $200+. Cleats cost around $22, depending on the brand, but are usually included with new pedals. 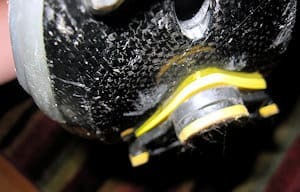 It’s worth noting that for Shimano pedals there are two types of cleat; black, which just hold your foot in one position, and silver which allow a little float so your foot can move around to a small degree on the pedal. Some other brands also allow float by various means. Road pedals : Usually consist of a large single-sided platform which engages with a plastic cleat which is bolted on the bottom of the sole of the shoe. This means the cleat stands proud of the sole of the shoe which makes walking awkward and requires a little more attention to engage. At first you’ll only get it right 50% of the time. The shoes usually have a smooth sole which is designed to be very stiff, making walking more difficult still. So, why would anyone ever want to use road shoes and pedals when mountain bike systems are much more user friendly? Road cleats are large and project from the sole of the shoe. Carbon fiber enables a very stiff foot-bed. Well, road shoes are designed to give the maximum support to your foot and enable the most efficient transfer of power from your legs to the drive chain of the bike. They do this by providing an extremely stiff sole and comparatively large cleat to minimize flex in the shoe and pedal. Imagine just sitting at home flexing a cycling shoe a few millimetres 120 times a minute as a pair of shoes might on a bicycle. Then consider the energy you’ve used to do this. That’s the amount of energy which could have been pushed out your back wheel. Also, if you have foot issues, numbness, hot foot, pins and needles, etc, these can be alleviated by using a road shoe which will provide more support than a mountain bike shoe. If your left/right shoe size is radically different then we might still be able to help you. Expect to pay $100-$120 for a basic road shoes. If you’re looking for a carbon sole, then expect to pay $200+. A high end road shoe will be up to $500. Halter’s sell cycle shoes by Giro, Sidi, Shimano and other good makers. We sell pedals by Crank Brothers, Look, Shimano and SpeedPlay as well as specialist pedals for downhill, BMX and other genres of cycling. We stock shoe accessories such as adaptive insoles, arch extenders and cleat wedges to align your pedal stroke. Consider buying appropriate shoes and pedals as part of a complete bike fit. This is free with the purchase of a road bike from Halter’s or available via appointment.